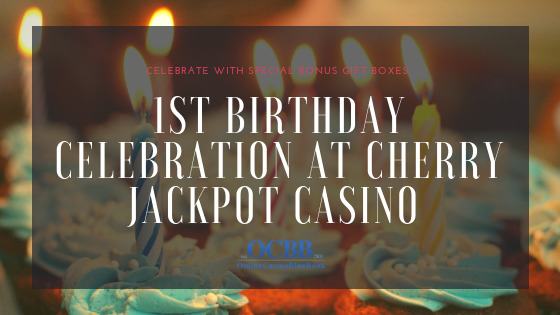 1st Birthday Celebration at Cherry Jackpot Casino – Come Celebrate! Cherry Jackpot will be celebrating their first birthday on October 3rd and excitement is in the air! This birthday is the commemoration of one year since this online casino opened its doors. Cherry Jackpot is the sister to CasinoMax which is the first casino brand from the mother company and Roaring 21 which is the latest casino from this company. There will be a ton of presents, gift boxes with special codes and surprises for all those who will be celebrating the birthday together with the casino. Players will be treated to some fantastic offers for Cherry Jackpot’s big day. Even new players who join now will be able to enjoy the celebration. This party is an excellent opportunity for new players who would like to participate. New players and existing players will be able to party with the casino! To enjoy the casino offers being given during Cherry’s birthday players need to open gift boxes. These gift boxes are handed out by the friendly and fun casino host team. Players will get them through emails, live chats, and phone calls. Players can get their gift box at any time since the gift boxes are handed out to the players 24/7 during the birthday celebration. Every player is eligible to get a single gift box each day regardless of whether it is a current player or a new player. Event Dates are September 28th-October 3rd. Players at Cherry Jackpot Casino will be surprised every day with different exciting offers when they open their gift boxes. The gift boxes contain promo codes. The boxes include free spins, free chips and free bonus money that come with some juicy deposit match bonuses. The entire birthday party will run from September 28th to the official birthday day which is October 3rd. During the Cherry Jackpot birthday celebration, all players will get to enjoy gifts! The big day on October 3rd will be fantastic, because this is when Cherry Jackpot will give players the best gifts, worth the most. If you love online slots, make sure you visit the casino during Cherry Jackpot’s celebration. The entire promotion period will be exciting with the players being able to enjoy gifts every day. So, make sure you are signed up before the festivities start! Since new players are eligible to enjoy the offers that are available during the birthday celebration, this makes it an ideal time to tell your friends and family to join. New players who join now are in in a great position to even win fantastic prizes. Players can open their gift boxes at whatever time they are free regardless of the time. Since Cherry Jackpot has grown significantly in the one year it is time to celebrate!